For years there have been whispers of the Bangladesh Nationalist Party’s foreign connections. Its closeness to Pakistan and especially with Islamabad’s notorious ISI has been a subject of endless discussions. Now into the picture comes Israel’s dreaded Mossad and its alleged linking up with the BNP. It was Shahriar Alam, Bangladesh’s Minister of State for Foreign Affairs, who first threw light on the BNP-Mossad connection a few days ago. While initially the junior minister’s revelation may have been taken with a grain of salt, it now appears that there might have been something that could not be dismissed outright. Authorities in Bangladesh arrested a member of Bangladesh Nationalist Party (BNP), the country’s opposition party on Sunday in connection with allegations that the party official, Aslam Chowhury, had purportedly made contact with Israel’s Secret Service Mossad in an effort to overthrow the Bangladeshi government. “We arrested him (Chowdhury) as investigations revealed he was involved in a plot to oust the government with Israeli support…He personally met an Israeli politician abroad,” police’s detective branch commissioner Abdul Baten told reporters. Police had earlier said they launched an investigation into BNP’s alleged connection with Israeli Mossad intelligence agency. 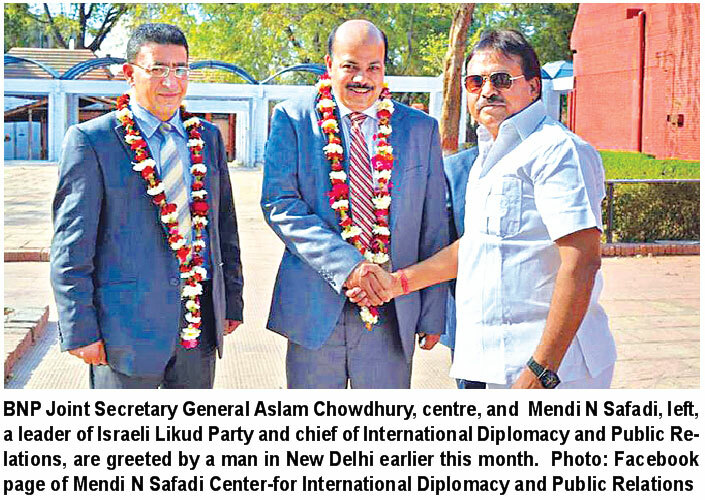 The Daily Star, which is based in the Bangladesh capital, Dhaka, named the Israeli who purportedly met with Chowhury as Mendi Safadi, whom it identified as “a leader” of Prime Minister Netanyahu’s Likud Party. DelAviv, an Indo-Israel relationship platform, and Mendi N Safadi Center for International Diplomacy and Public Relations, posted the photos. The reports sparked uproar in Bangladeshi media and political circles. On 26th January 2016, the Jerusalem Online reported that Mendi Safadi, the head of the Safadi Center for International Diplomacy and Advocacy, is working in order to topple the present government within Bangladesh in favor of a new government that supports establishing full diplomatic and economic relations with Israel. “Soon, the gates of Bangladesh will open up to Israelis in all aspects and this is not an impossible wish,” Safadi explained. Chowdhury is known to be a trusted lieutenant of BNP’s senior vice-chairman Tarique Rahman, who is former prime minister Khaleda Zia’s son and has taken political refuge in the UK to evade a number of graft and criminal cases in which he is being tried in absentia at home. Related: UK has been traditionally the largest sanctuary to not just money launderers and fraudsters but foreign terrorists and extremists as well. There are as many as 131 pending pleas for extradition of wanted criminals from Britain by India alone. Everybody, who is somebody in the world of terrorism, has found a rear base in the UK. The BNP of course has been dismissive of such reports. It and its politician in question have come forth with the pretty weak statement that the meeting with the Mossad man was a pure coincidence, meaning the two men simply ran into each other. But what has been left unexplained is the presence of the garlands on the BNP politician and the Mossad official as appeared in photographs. Unexpected meetings do not produce garlands or other such demonstrations of happy companionship. This however is not a new development and the plot to get rid of the Bangladeshi Prime Minister Sheik Hasina is in motion atleast since a couple of years if not earlier. In 2014 India’s top counter-terrorism agency had uncovered a suspected plot by a banned militant group Jamaat-ul-Mujahideen to assassinate the prime minister of Bangladesh and carry out a coup. The alleged conspiracy was discovered after two members of the group were killed in an explosion while building homemade bombs at a house in West Bengal in eastern India. Intelligence agencies often operate in other countries by using local hitmen/criminal gangs as a cover and a buffer to avoid detection as we saw happened in the 26/11 Mumbai Attacks. So even when the plot is exposed all evidence will point towards the local culprits shielding the major geopolitical players from the crime – a classic false flag. What is happening here is the use of the local Islamic militia as a cover and India as a base to launch an attack on Bangladesh, and finally throw the blame on India. When the Indian officials realised that they were tabliqis (Islamic preachers), they let them go. They had planned to attend an Islamic convention near Dhaka, but Bangladesh refused them visa. Later, seemingly under Israeli pressure, India allowed them to fly to Tel Aviv. For many years, British and Israeli intelligence agencies have been trying to penetrate Indian establishments. This first hand intelligence is needed by them to make decisions on economic policies and gain benefits for their native corporations. India has also set up its massive counter intelligence wing to deal with such penetration. 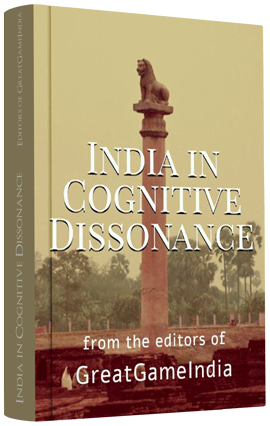 Of late it has become easier for Israeli and British intelligence to penetrate rightwing organizations and thus have access to other departments of the Indian government, aided by a shared ideology on Islamic terrorism. The same tactic is utilised while penetrating the Islamic militant organisations as we saw in the above cases. It is this very infiltration angle and the nexus between rightwing organizations and Israeli intelligence, thus US intelligence, which was uncovered by the slain ATS Chief Hemant Karkare. He was assassinated for the fear of this very nexus being uncovered and the geopolitical players exposed. Shelley Kasli for GreatGameIndia – India’s only quarterly magazine on Geopolitics & International Relations.